5 years ago I wrote that the best personality to have in architecture consulting was the “Type A” – a personality type characterized by ambition, high energy, competitiveness, and thought to be susceptible to stress and heart disease. The whole Type A/B model of personalities isn’t a very reliable one (it was concocted by cardiologists in the 1950s), but I went with it since it is still in colloquial use, and was close enough to my meaning. The point was to stress the importance of being aggressive and/or assertive at the right times during your IT consulting work, although this is not always the right way to be. 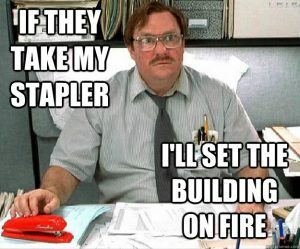 Knowing when to turn on your Inner Hulk, or your Inner Milton Waddams (the wimpy guy with the red stapler in the movie, Office Space) depends on where your baseline is. So here is some wildly conflicting personality advice that will or will not apply directly to you. The Yes Man who strives so hard to help and be helpful, that he takes on too much work needs to practice “No”. This type of person has typically built up so much credibility with the client and his peers, that he has nothing to lose by consciously under-doing it on the job. Its also a mark of maturity to not over-commit, but to be deliberative and circumspect about a task or a project before setting an expectation that it will be done. Also – the Yes Man is the one at most risk of agreeing to do so much ancillary stuff that he may actually fail at this core responsibilities. For example, if an architect agrees to too many project management-type tasks, he risks failing at his core architecture activities. If you are “chatty” or tend to talk over others, observe that in yourself and strive to shut up and allow silence. This is especially important in our role as consultants, since we so often facilitate debates, discussions and other types of meetings. Being comfortable with silence, allowing pregnant pauses, is another sign of maturity. Its also effective in allowing a voice to the more passive participants in your conversations. If you are “mousey” by nature, own it and consciously amp it up! If this is you, and you begin talking so much that it feels uncomfortable, then you’re probably talking just enough. Especially if you are running meetings, you need to both keep the group’s energy up, and keep the agenda moving. Talking more does that. The old “Type B” personality was not necessarily passive or wimpy, but was more curious and reflective about things. This is the Curious Guy. Although being mindful and deliberative is an advantage in IT consulting (and other professions), getting so intensely interested in a problem, new business or new technology domain is a bad idea, if it distracts from your primary objective. Again – if you know you tend this way, then consciously try to ignore any Shiny New Intellectual Object and get on with the task at hand. Lastly – the person who isn’t naturally attentive to every detail will often not inquire enough about a problem he is charged with solving. Just as with the No Man, the Non-Curious Man (or Woman) is probably a disadvantageous personality type in IT consulting, though it too can be coached. The basic advice for this type of person is to be relentlessly curious and inquisitive about every aspect of a problem or solution, and strive to know as much about it as possible. Just as with other techniques to “overdo it”, this one will land the Non-Curious Person right about where they should’ve been. I’ve given all this advice to different people over the years, informally and in employee reviews. Its my job as a mentor and manager to know these personality traits, spot them in my people, and coach them toward a “magical mean”, of sorts. Its also my responsibility to take the same feedback from my peers, managers, and even loved ones – and to aim at the same thing myself.